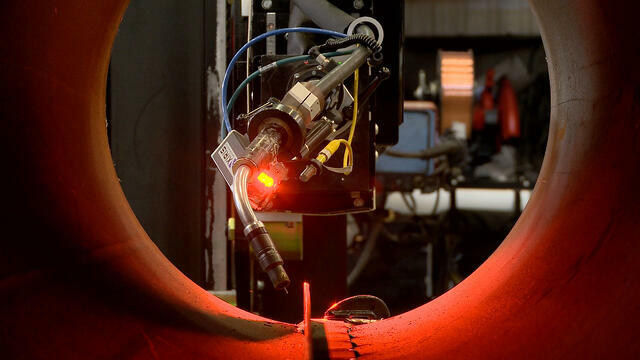 A pipe fabrication shop in Mexico was awarded a contract that required multi-process welding. First, they needed to stitch weld baffle plates, using a MIG process, along the inside long seam of an 18" diameter pipe up to 16 feet long. Inside diameter (ID) welding the baffle manually, with a worker in a confined space proved to be laborious, uncomfortable, and unsafe for the worker. The customer also required a submerged arc (sub-arc) process for external circumferential welds. 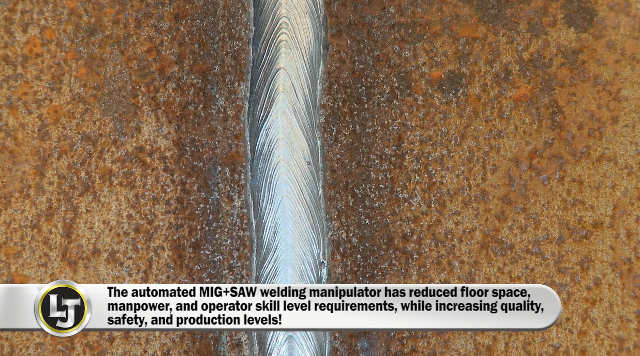 Finally, they had limited floor space and a strict budget to meet, so they turned to LJ to design and build a MIG + SAW welding manipulator with both functions built into one machine. The original process involved manual welding in a confined space. Once the inside work was complete, they planned to move the vessel to another station, where they would then complete the external welding work with a submerged arc, column and boom welding manipulator system. The overall process was unsafe, inefficient, required excess handling, and more floor space than the customer could afford. Custom design and engineering, including a specially designed narrow head MIG system with a weld camera. Custom automation controls for the integration of the SAW, MIG, column and boom manipulator and camera system. The outcome was a singular control panel that integrated all functions required. Specialized column and boom that has a 6' mast (column) with 16' reach (boom). 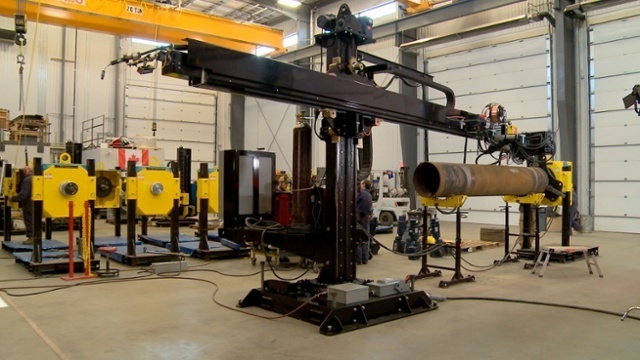 One end of the welding manipulator boom is equiped with a sub-arc system, complete with flux delivery & recovery. Opposite end of CaB manipulator set up with specially designed narrow head MIG welding system with open arc welding camera. MIG preprogrammed for the stitch weld that's required. Customer does not require two separate stations for welding. With specialized narrow head MIG system, no longer required to send a welder into a confined space & all welding can be done on the workpiece's exterior. Pre-programmed automated stitch welds. Circular external welds completed by a sub-arc system which has a higher deposition and more consistent weld than manual MIG or TIG welds.